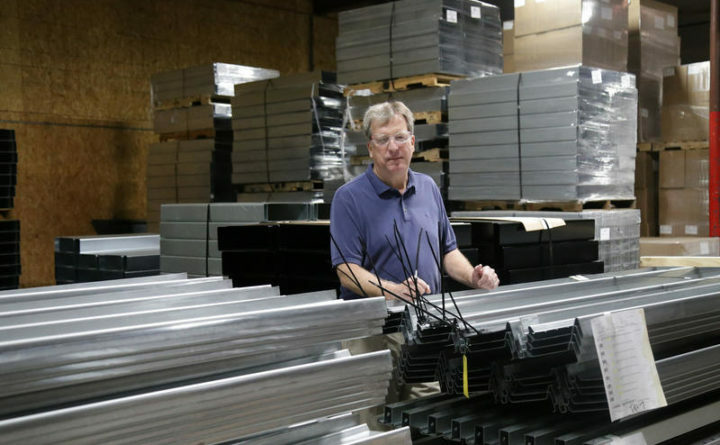 Hussey Seating President and CEO Gary Merrill in his company's steel fabrication area. North Berwick sports-seating manufacturer Hussey Seating is sounding alarms about the effect that President Donald Trump’s steel tariffs are having on its bottom line – a concern independent Maine Sen. Angus King said is widespread in the state and beyond. Hussey CEO Gary Merrill said his company and many steel-based businesses in the Northeast depend on Canadian suppliers for raw materials, and that the tariffs that the White House announced recently will damage revenues at the company, which employs 300 people. Trump’s recent trade action includes a 25 percent tariff on Canadian steel and a 10 percent tariff on aluminum. Merrill said that the commodities market started reacting to the expected tariffs months ago, and between them and other market forces, Hussey’s steel costs have already spiked 45 percent this year. “Hussey seating is an example but there are probably a hundred others in Maine and thousands across the country,” King said. King said he wants to see changes in the nation’s trade relations, but the president should use a scalpel, not a chainsaw.